I try to be as fair as possible when I write a review. I put together a post based on a series of visits - I don't want to slate a cafe simply because the barista was new, or was having a bad day. However, some coffees have to be sent back - not something that I enjoy doing, but ultimately it helps the barista to improve their techniques. I'd argue that most baristas would rather know if something was wrong, and have an opportunity to correct it, rather than lose customers. The piccolo latte below is a good example of how things can go wrong, even in cafes which serve consistently good espresso shots. The initial hit of espresso was hardly tempered by the foam, which was coarse and irregular. As a result, the smoothness and mouthfeel that should be imparted was lost. A good piccolo latte will have foam that mixes with the espresso and milk mixture with every sip - however, this was not the case here. Over time, the initial hit of espresso faded, which left a watered down drink, and the interesting, if disconcerting, experience of a piccolo turning into a flat white halfway through. It's worth noting that this is an issue that can be solved - it's not something that would stop me from visiting the cafe in question again. 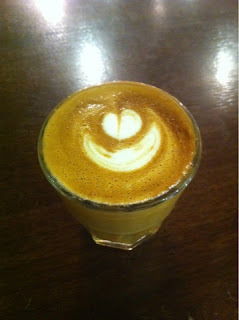 The underlying espresso shots are good, which means that the foundation for a good coffee is still there.